Ready-to-apply, self-adhesive cut-out oval USA vinyl lettering made from premium white vinyl (vehicle not included in this offer). 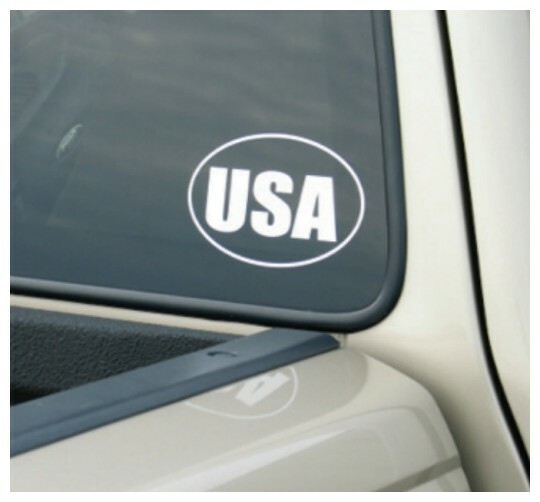 These USA Euro window stickers are not stickers that are printed on clear backgrounds, it is actual die-cut vinyl for long lasting window graphics (up to eight years in most areas of the country). This is a cost saving easy Do-It-Yourself project for any member of the family! These awesome looking vinyl cut-out oval EURO stickers measure a whopping ½ foot wide and 4" tall and all come with a semi-transparent pre-masking for easy application. I am sure that everyone knows what these are but if in doubt, they are like all those stick family figures that you see on the rear window of passing cars. Still not sure, click here for a free sample of ready-to-apply lettering (sample will not be this item). These awesome vinyl lettering cut-outs only come in our most popular white vinyl, but if white is not your thing, we can do any color from our vinyl chart page. We also specialize in recreating your logo or design for your vinyl graphics. All window lettering, oval EURO window stickers and logo designs are available in Reflective, Sandblast, Matte, High Gloss, Marble, and all 3M® colors. Contact us for pricing. Check out our Spring Sale for savings on Oval USA Vinyl Lettering and USA EURO Window Stickers in the following link. 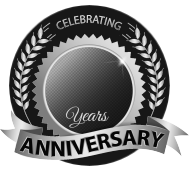 BBB Member since 2004 with a proven record of complaint free customer satisfaction on items like Oval USA Vinyl Lettering. Click on the BBB logo above to check our record or leave a customer review. If you are in the market for USA EURO Window Stickers, give us a call today and you will soon realize why after 24 years we still have an A+ BBB rating! At deSIGNerySigns.com we have more than 24 years experience in designs for our USA EURO Window Stickers. Call us today and let our design specialists help create your next project to promote your product or business. FREE Shipping on all decal and sticker products | Free layout | A+ BBB rating | 24 years in the business | Call Today for a free quote on USA EURO Window Stickers.